You know what's awesome? Kids. You know what's not awesome? Cancer. And, sadly, sometimes cancer happens to kids. I had a childhood friend who didn't survive his battle with the big C, and I think that hurt even more than losing my grandfather to it. No one should have to endure such a horrible disease, but especially not children. There are some great resources out there for the families who are fighting for their children's lives. St. Jude's, for example, exists "to advance cures, and means of prevention, for pediatric catastrophic diseases through research and treatment. Consistent with the vision of our founder Danny Thomas, no child is denied treatment based on race, religion or a family's ability to pay." "Treatments invented at St. Jude have helped push the overall childhood cancer survival rate from 20 percent to more than 80 percent since it opened in 1962." However, there's more to it than just providing treatment. Over 40% of the children diagnosed with cancer are more than 60 miles from their closest treatment center. Some are forced to travel much farther to receive the specialized care required to save their lives. Even with organizations like St. Jude's available to families unable to shoulder the burden of cost, there has been little assistance given to help reduce the cost of travel often necessary. In 2010 Michelle Ernsdorff started Compass to Care, a 501(c)(3) charitable organization, to ensure all families can access life-saving cancer treatment for their children. Michelle was stricken with kidney cancer at just one year old, and her parents traveled over 200 miles from their hometown of Dubuque, Iowa to the Mayo Clinic in Minnesota for two years until her cancer went into remission. "In the four years since its inception, Compass to Care has made similar journeys possible for 112 children!" For the last two years, Compass to Care has put on a fashion show to raise much-needed money to continue expanding. I was honored to provide photography for last year's event, and I was thrilled to be asked back again this year. HGTV Design Star Kevin Grace, who recently went to work on the Steve Harvey Show, signed on to emcee. Past shows have featured police officers as models. This year cancer survivors took to the runway, escorted by police officers. There was even a special appearance by the Guest of Honor, Compass to Care recipient Lillian. The goal was to top last year's take of $18,000 and push for $25,000. Would you believe that the attendees' generosity kept pouring in, and an astonishing $85,000 was raised in one night?!? Today's Chicago Woman Magazine will be featuring the soiree in its next issue. I couldn't be more proud to be part of such an amazing event! As amazing as it sounds, that money will go quickly. Compass to Care needs your support to continue its mission. Please consider offering a donation of any amount to this organization. It really could make the difference to a child in need. This Sunday at Chicago Photography Center is the Opening Reception for CPC's Outreach Exhibition. The Outreach Program, headed by Betsy Lent, was established to provide access to photography for underserved and overlooked communities. This year marks the fifth exhibit of work from the group, and a new partnership with Catholic Charities' After Supper Visions Program. Photography from both programs will be on display, and many artists will be on hand to meet visitors. Admission is free, and light refreshments will be served. For more information, visit www.chicagophoto.org. What a surprise to see my own work featured as the lead image in a recent article on thrillist.com! I did a series of photographs for Guthries Tavern last year in preparation for an update to their website. The owner, Steve Leith, wanted to capture the atmosphere of the place and highlight some of the things that make Guthrie's so unique. Around 1900, the location was a corner grocery store. In 1933, after prohibition, the Moretti family turned it into a corner tap. Having had many bar names and proprietors over the years, Steve the current owner opened Guthries in 1986 and has enjoyed serving the Lakeview neighborhood for almost 30 years. The spot boasts a fantastic beer list, a huge selection of board games, a cozy back porch, and super-friendly staff. It's the kind of place where no one is a stranger. If you're in the neighborhood, do yourself a favor and check it out! Just what is the "Bubble Ball," you must be thinking? With a name so lighthearted, the last thing to come to mind is domestic violence. However, that's just the issue this event is designed to fight (for lack of a better word). You see, the Bubble Ball is an annual fundraising event put on by Between Friends Chicago, a local nonprofit "dedicated to breaking the cycle of domestic violence and building a community free of abuse." 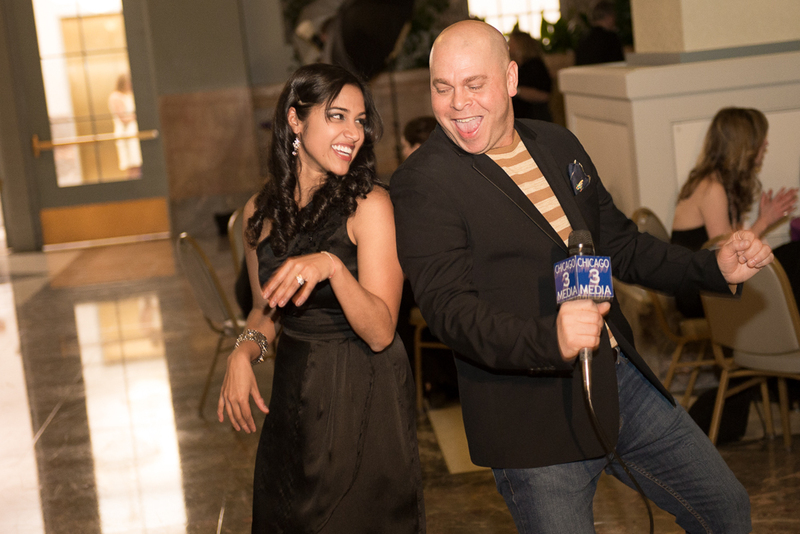 The organization has been providing life-saving and life-changing programs and services since 1986, so I was honored to help HGTV Design Star Kevin Grace (of Kevin Grace Design) cover the event for Chicago 3 Media. Since appearing on the HGTV hit show, Kevin has grown his following with frequent appearances on Windy City LIVE! He partners with retailers like Crate and Barrel or West Elm to make over homes for deserving guests in a segment called, "Save My Space." 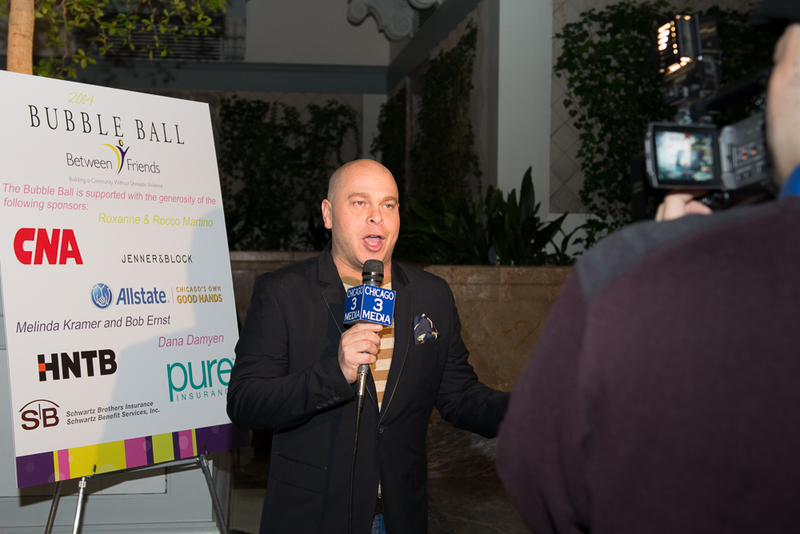 Somehow between balancing a successful design business with a growing TV career, he manages to contribute to other great causes like the Bubble Ball. He co-chaired last year's event, and this year he returned to bring much-needed attention to the fundraiser. There was an extensive silent auction and raffle, delicious food, fun music, and a special award presented to Mayor Rahm Emmanuel. If you missed it, consider attending next year. In the meantime, you can support the great work of Between Friends with a tax-deductible donation. Anything you can spare is appreciated, and will surely make a difference. NBC Chicago anchor Marion Brooks put it best when she said, "Every little bit helps!" Check out this video and the photos below to see what you missed! In Community, Events, Photography Tags Between Friends Chicago, Bubble Ball, Charity, Chicago 3 Media, Crate and Barrel, Fundraiser, HGTV, HGTV Design Star, Kevin Grace, Kevin Grace Design, Marion Brooks, NBC Chicago, Nonprofit, Rahm Emmanuel, West Elm, Windy City LIVE! Mario and I took our dog, Tony, to a "Pug Party" Saturday. And, just in case you don't already think we're way too into our dog - Mario was planning to fly to Texas to visit family on Friday (with Tony in tow), but changed their flight to Sunday so that we could attend. It's a good thing our friends Drew and Andy from the Chicago Photography Center sent us an invite. We would have been so sorry to miss all the festivities. They have two Pugs, Rupert and Minni, who have their own Facebook page. As you can see, "Pug People" (I try to avoid the term "Pug Owners," which seems to offend) are devoted. They take this stuff seriously. Chicago Photography Center needs your help! When I discovered CPC, I was at a low point in my life. In many ways, this place actually saved my life. I have been empowered and transformed by it, and I feel a great sense of pride to be part of such a powerful and supportive community. Everyday I can witness and be part of that same transformation in other people. Photography is a vehicle of change, and it happens at CPC. This summer I joined the Board of Directors. It is one of the greatest honors I can think of, to be able to give back in this way. It has also opened my eyes to how precious an organization we are and how we face many challenges to continue our work. Every not-for-profit struggles with funding, but we are currently battling some unforeseen expenses (broken water heaters, failing AC, among others) that could jeopardize our programs. Take a class. If you are interested in learning new skills, or taking your skills to the next level, CPC's offering of classes taught by incredible instructors has something for everyone. From one-day to seven-week formats, there are topics of all kinds: film photography, digital manipulation, studio lighting, weddings, etc. Attend a lecture. Fall Lecture Series: The Future of PhotographyPhotography is a changing field due to advances in technology, how we perceive photography and its role, and its accessibility in recent years. Join us as we take a more in-depth look at a few areas. Donate whatever you can! If you aren't up for a class or lecture, live out of state, or simply can't afford the ticket price - Please give whatever you can spare. Skip your Starbucks today, pick Netflix tonight instead of the movies... Every donation, no matter how small, does make a difference! I will sweeten the deal, however, for those of you who are generous enough to donate - For every donation you make of $25+, I will give you an 8x10" color print from my series "Franny and Zooey," recently displayed at CPC! Let me know if you pull the trigger. I'll get your print(s) to you ASAP. Thanks for taking the time to read this. Every dollar we bring in - be it from classes, lectures, or donations - will help ensure we keep our doors open and programs running. Your support means the world to me, and so many others!